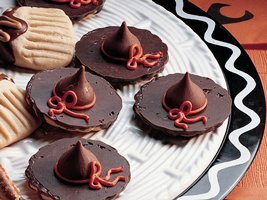 I wanted to take a sweet treat to work on Friday to share with my co-workers for Halloween but I was too tired on Thursday evening to spend a lot of time in the kitchen, so I was lucky to find the instructions for witches’ hats online at BetterCrocker.com. The hats were a big hit at my office. If you’re looking for a last minute idea for a treat that involves no cooking and can be made in a matter of minutes, this is it! What a good idea! I want one!